Intimate partner violence (IPV) is the most pervasive form of violence globally, with one in three women  physically or sexually abused by a partner in her lifetime (Devries et al. 2013). IPV has multiple malign consequences for the physical and mental health of women, as well as a range of adverse effects on their children. While these consequences are well documented, there is less evidence on the effectiveness of policies and programmes in reducing IPV in the developing world. Drawing mainly from Latin America, several recent studies find evidence that cash transfer programmes, targeted primarily at women, can reduce IPV. Given that cash transfer programmes are widespread around the world – implemented in over 130 countries and reaching approximately 718 million people globally  (World Bank 2015) – they represent a promising, scalable, globally-relevant approach to reducing IPV. However, important questions remain as to whether policymakers can generalise the existing findings to diverse settings and whether these programmes provide a sustainable approach for IPV prevention. Each case study draws on a cluster-randomised control trial to measure the causal impacts of the transfer programme on IPV, and mixed methods to understand what happens and why. All studies use the WHO Violence Against Women instrument  (Ellsberg and Heise 2005) to measure IPV which was administered following the WHO protocol on ethical guidelines for conducting research on women’s experience with IPV. Table 2 summarises key features of the case studies’ designs. Six to ten months after the programme ended, transfers + BCC led to a 26% reduction in physical violence, but there were no impacts from transfers only on IPV six to ten months post-programme. 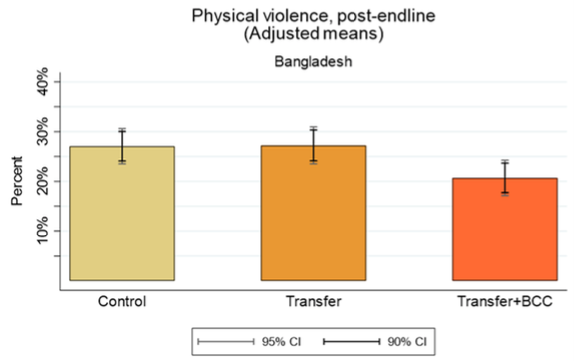 BCC was required to sustain the impacts of transfers on IPV  (Roy et al. 2018). Impacts depended on household structure . 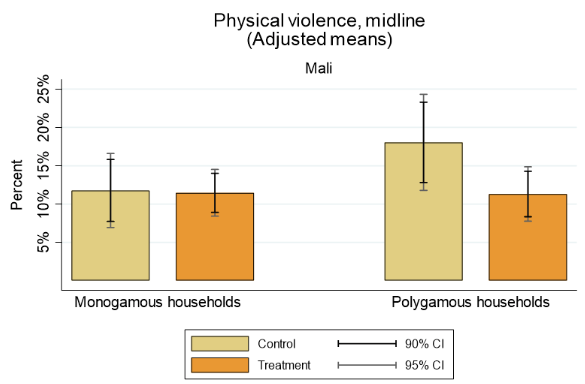 Cash transfers led to a 41% reduction in physical violence in polygamous households, but they had no impact on monogamous households (Heath et al. 2018). There are three pathways outlined in Buller et al. 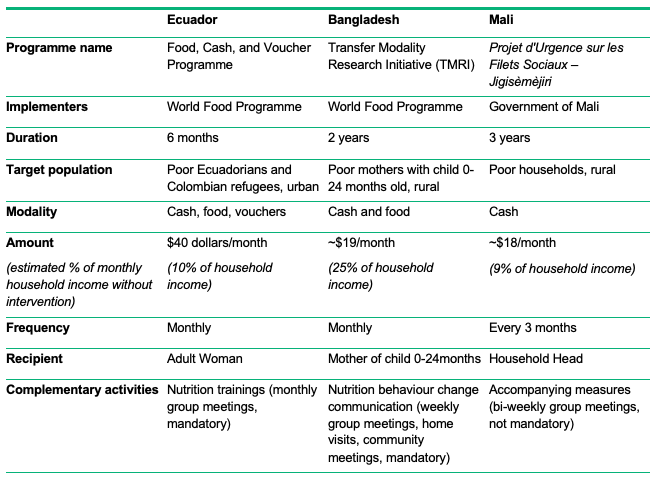 (2018)  through which cash transfers can affect IPV. Buller, A, M Hidrobo, A Peterman and L Heise (2016), "The way to a man’s heart is through his stomach? : A mixed methods study on causal mechanisms through which cash and in-kind food transfers decreased intimate partner violence ", BMC Public Health 16(488), 1–13. 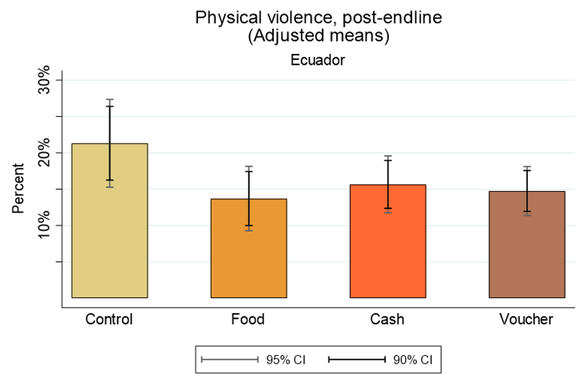 Hidrobo, M, A Peterman and L Heise (2016), "The effect of cash, vouchers, and food transfers on intimate partner violence: Evidence from a randomised experiment in Northern Ecuador ", American Economic Journal: Applied Economics, 8(3).